We Ready. – #DoubleFML FatDarrellPalooza! Yeah yeah, I know that title isn’t grammatically correct. It’s the song title for “We Ready” by Archie Eversole ft. Bubba Sparxxx. Surely you’ve heard it by now. It feel like it’s been on an endless loop during every commercial break for the past 2 months! I like to think I have my finger on the pulse of music and pop culture, but it actually took my father to point out that song is a blatant cover of “Na Na Hey Hey Kiss Him Good Bye” by Steam which was released in 1969! Anyway, get used to that melody. These commercials won’t be going away anytime soon. Well, at least not until after The Super Bowl is over. Speaking of The Super Bowl, “We Ready” here in Atlanta too! I showed you the early progress of the stadium last post, but check out these updated photos! They even started wrapping logos on other landmark buildings throughout the city! Check it out! And since Coca Cola’s world headquarters is less than a mile from the stadium, Pepsi has been rubbing in the fact that they’re the official sponsor for weeks! I’m hoping the airport will be ready too though! Atlanta is already one of the busiest airports in the world without The Super Bowl! It’s hard for TSA personnel to afford food, daycare and transportation without a paycheck so many are calling out which is leading to longer lines and security risks. We don’t really discuss politics here, but I will say this whole shutdown situation is a mess and definitely needs to get fixed asap! As for me? I’m also ready! Last post, I was anxiously awaiting work from my manager at Mercedes Benz Stadium that our Live Events crew would be working the big game. Although I work for the Live Events team, the NFL has their own massive crew that takes over during the Super Bowl so most of the positions that would normally be filled by our team are already taken. I was originally being considered to help shoot the confetti at the end of the game, but unfortunately that’s no longer the case. However, one of my supervisors sent me the application to apply for a position with the halftime show production crew and I got the gig! My official title is Super Bowl LIII Field Team Member. I’m still not sure of my exact role yet, but I’ll find out during our meetings this week. We’ll have several leading up to the game! Aside from that exciting news, a lot has happened in the past few days. Last Friday, I represented The Atlanta Hawks Flight Crew along with Harry The Hawk at a pep rally for Morrow Middle School in Morrow, GA.
Saturday night it was back to State Farm Arena as The Atlanta Hawks took on The Boston Celtics! Prior to the game, I performed my original Hawks Anthem, Ready (not to be confused with We Ready) for the crowd gathered by the entrance. The sound quality of this video is pretty terrible but here’s a brief clip. Here’s some additional footage of us entering the concourse during the Fox Sports South Broadcast too. Check it out! I also won a $25 American Express Gift Card from Verizon Wireless in a contest they were running before the game! My nephew’s birthday is next week so spoiler alert, DJ, guess what you’re getting buddy? Happy Birthday! We also had a few special guests in attendance that night. Taraji P Henson was there to promote her new movie “What Men Want”! At one point, I was standing 5 feet away from her as she was being interviewed but I obviously couldn’t break out my camera for a selfie in the middle of the court! …at least not if I want to keep my job! We were also excited to have newlyweds Yuki and Yumea Nakagawa at the game all the way from Japan! They also made a brief cameo at the end of the in the Fox Sports South video above. If you’re unfamiliar with their story, they celebrated their honeymoon by attending 13 NBA games in 13 days! You can read more about their journey in this article by The Wall Street Journal by clicking here. Since it was a special occasion, I broke out my Tricerataco during our pre-game meal! Since I first mentioned this item back in 2017, they’ve rolled out several other dinosaur taco holders including a T-Rex! I may need to invest and turn my dinner table into Jurassic Park soon. Before we continue, I must say it was much easier to eat tacos before I had this beard! I’m still getting used to this thing. I keep getting sour cream and queso stuck in it! Unfortunately, most people are way too polite to say anything …or they just don’t care! Either way, one game I found a random glob of cheese on the side of my face halfway through the first quarter! …and no, I didn’t eat it if you’re wondering. Anyway, Sunday was that weird blood moon eclipse! Did you see it? It was really cold outside so hopefully you had a clear view of it through your window. When the moon hits your eye, like a big pizza pie…that’s amore. Apparently, I’m not the only one since others on our social media pages had similar experiences (click the logos on the side panel to follow me on Instagram, Twitter, Facebook and more!) but I had some crazy dreams that night! How about you? Comment below! Monday of course was Martin Luther King Day. My friends, family and coworkers would all look a lot different had it not been for his amazing sacrifices so thank you Dr. King! We had another Hawks game on MLK Day so we had choir performances, video tributes and our crew was provided with these incredible tees to wear instead of our regular uniforms. Check it out! Hawks star point guard Trae Young also rocked these designer MLK kicks for the game as well! Wow, I like those! Hey Trae, if you’re reading this, I’m a size 10, thanks! While we’re on the subject of dreams, today’s fitness tip is to also keep your dream alive by writing it down. We’ve gone over goal setting quite a few times so I won’t rehash that today but your next step is to keep that dream in mind during your workouts. Too often, I see people zoned out reading text messages as they go through the motions on the leg press. Gotta tune out those distractions! The mind and body connection is real though and it’s powerful. You have to think about the muscles you’re training and will them to grow! Visualize those fat cells burning! You have to stay focused or you’re going to end up taking the scenic route to those goals instead of the fast track! How are those fitness resolutions going anyway? Keep going! You can do this! Hmm, considering these are the strange thoughts I have while awake, I suppose it’s no surprise my dreams are bizarre. Anyway, let’s get out of here. Cue the music! Before we go, let’s check out the foodie holidays that occur between this and next post, shall we? Well what do we have here on January 23rd? 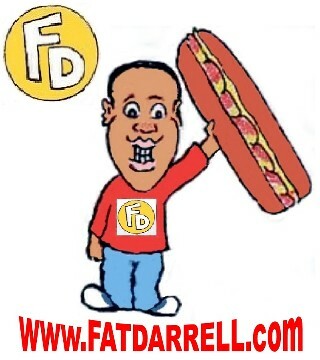 Why, it’s ®Fat Darrell Day! That’s right folks, January 23rd is the birthday of my namesake sandwich! And no, Fat Darrell Day isn’t on the official National Day Calendar yet, but it should be! I’ve got a year to change that though, so we’ll see what’s in store for 1/23/20. As for the rest of the list, there are a few other great ones like chocolate cake and peanut butter! Oh my. Hmm, what’s a “blonde brownie” though? I’ll have to look it up. That actually reminds me of my ex! Although the blonde was a weave…. Wait, what? Anyway, those of you still crying over The Patriots making it to the Super Bowl again, you have to at least respect their consistency. This was also a classy move by Tom Brady after the AFC Championship game. Who are you rooting for? The Los Angeles Rams or the New England Patriots? Comment below! Even if you hate football, comment about anything below! Shout out to the few who do each post but the rest of you need to stop being shy! Anyway, that about does it for this post. I start my Halftime Show training this week so I’ll update you on that next post! In the meantime, let’s continue the conversation below and on social media! Stay warm out there, the weather’s been pretty brutal lately! Thanks again for stopping by! Let’s make it a great week people! This post is incredible!!! Where do I begin? I see that you have been “super busy!” I really enjoyed your experiences on the job, the flow of topics, fit tips and seeing you perform your “Ready” song. Before reading this post, I had decided not to root for either super bowl team, but thanks to you sharing what Brady did after Sunday’s game, I am going to vote for the Patriots. Thank you for your comments as always! Here in Atlanta, most people are rooting for The Rams since The Patriots embarrassed The Falcons a few years ago. I’ll be rooting for New England though! Either way, it should be a great game! What a great opportunity to be in the midst of all that is going on in prep for the Super Bowl!!!. Just being in the Atlanta area right now, I am sure, is very excitingl!!! Congrats on being selected for the half time gig….also your Verizon win! Your nephew DJ will enjoy it. Lol Thanks for the great job you did with this post. Thanks! Yeah it’s definitely exciting times here in Atlanta right now. I’m looking forward to seeing the half time show spectacle up close! And yes, I’d better get DJ’s present in the mail asap! Thanks again for always commenting! Happy Fat Darrell Day 1-23-19!!! Even though not national yet, we are on our way!!!. Fantastic that RU Hungry is on track with it already and will surely make some extra money with their special offer today. In addition to this day, I see that we are loaded with great national days this week, especially Peanut Butter Day and Peanut Brittle Day. You have probably guessed by now, I am a “nut fanatic.” LOL Love pics, videos and memes and you with that Cow!! !